New England Patriots quarterback Tom Brady is trying to find a kidney donor for his ailing mentor and Tom Martinez, whose kidneys began to fail five years ago after he got a staph infection. Tom Martinez figures he first set eyes on Tom Brady when the New England Patriots quarterback was 10 and tagged along with his sisters to a softball clinic Martinez ran at the College of San Mateo in California. At 13, Brady signed up for Martinez’s quarterback clinic, and the rest, as they say, is history. Brady, now 34, has worked with the coach every year since and has said he would never have been the Pats’ quarterback without Martinez as his mentor. Now Brady, bound for his fifth Super Bowl on Sunday, is trying to repay his ailing 66-year-old coach by finding him a kidney donor. On his Facebook page a month ago, Brady posted a photo of himself and Martinez and a link to a website, www.matchingdonors.com, whose goal is to match altruistic living organ donors with strangers in need. A staph infection after leg surgery five years ago caused his kidneys to fail, Martinez says, and he has required dialysis four hours a day, four days a week. He also suffers from diabetes and heart problems. Now he’s one of the more than 90,000 U.S. patients who are waiting for a kidney, according to Anne Paschke, spokeswoman for the United Network for Organ Sharing, or UNOS, the nonprofit that manages the U.S. organ transplant system under contract with the federal government. UNOS works with organs only from deceased donor and has no official guidance about living donors. About a dozen Americans die every day while waiting for a kidney donor, according to the Alliance for Paired Donation, which helps facilitate transplant “chains” involving patients who have a willing but incompatible donor. Since 1988, nearly half of all transplanted kidneys, or about 110,000 out of about 243,000, have come from living donors, according to the Organ Procurement and Transplantation Network, part of the Department of Health and Human Services. Usually, living donors are relatives or friends, although they might be strangers involved in paired donation. Martinez, the father of three grown children, says no relatives have volunteered to be tested to see if they might be suitable kidney donors for him, and he doesn’t plan to ask them because it would put them on the spot. “I think it’s something you really have to want to do,” he told msnbc.com. Martinez says a friend found out about MatchingDonors.com, which was launched in 2004 by CEO Paul Dooley, who previously had run a job-matching website. Over the years, 150 kidney transplants have resulted from matches made through the website, says MatchingDonors medical advisor Dr. Jeremiah Lowney, an internist in private practice in Hyde Park, Mass. More than 10,000 people have signed up to be donors, but only about 500 patients have posted profiles, he says. MatchingDonors warns on its website that “it is absolutely against the law to have any financial benefit from organ donation,” but, Lowney says, he’s heard that some patients have been contacted by people trying to sell a kidney. Although donors recruited through MatchingDonors might not request payment before the transplant, that doesn’t mean they won’t afterward, cautions Arthur Caplan, director of the Center for Bioethics at the University of Pennsylvania and a frequent contributor to msnbc.com. In addition, Caplan says, some patients may not want to become public. And even if they do, he says, they might not be good at marketing themselves to prospective donors. Caplan says he’d prefer to see a national organ donor bank that would protect donors’ and patients’ privacy and allow transplant experts sort out who should get which organs. On the plus side, Caplan says, websites like Matching Donors might add a few kidneys to the overall pool from donors who might not otherwise be motivated. “Any time you can take someone off the (waiting) list, other people will move up that list,” Lowney says. Martinez’s listing on MatchingDonors was just posted Tuesday, but publicity about his need for a kidney has already attracted potential donors for two other patients on the site, Lowney says. 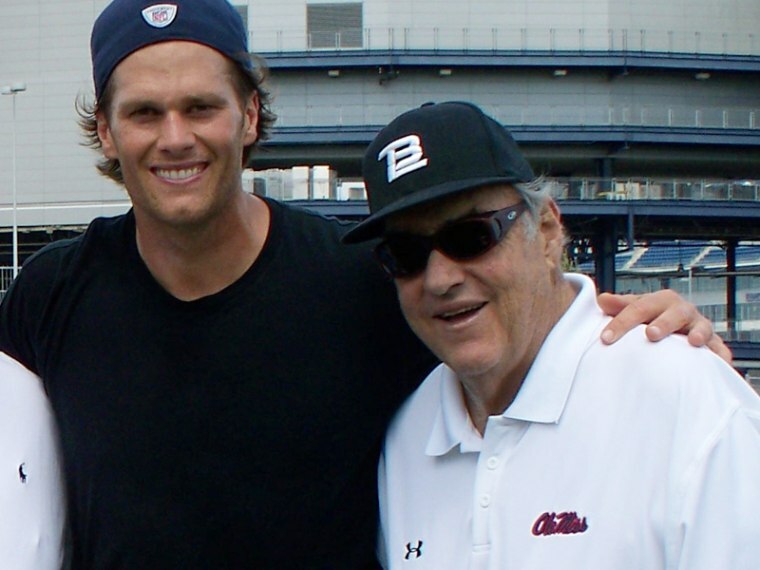 “Coach Tom Martinez is the world’s best father, grandfather and football quarterback coach,” reads his profile on MatchingDonors, which also quotes a Boston Globe article about his impact on Brady’s career. This Sunday, of course, he’ll be watching The Game. Would you donate an organ to someone you don't know? Tell us on Facebook.